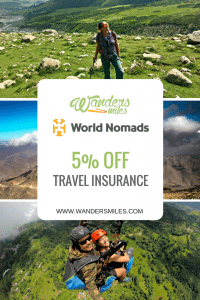 Wanders Miles have partnered with World Nomads to offer you 5% discount off your travel insurance policies, how cool is that? As an adventure traveller, I only choose World Nomads. They cover for the activities and adventures I love get involved with such as climbing Kilimanjaro, trekking in Oman, sailing on the Bosphorus, and mountain biking and in Kathmandu… to name but a few. WorldNomads.com covers a range of adventure activities, giving you peace of mind to get the most from your travels. How to claim your 5% discount – offer expires on 31st December 2018! For our Canadian and US travellers, unfortunately due to financial services laws, we cannot provide a discount. This promotional code cannot be used with any other discount offer, including World Nomads Members discount for travel insurance policy holders.